Hi. I’m back from an excellent trip to Seattle and busy catching up on all my projects. I spent the day stitching my ArtPrize entry yesterday and will resume work on the project today after a much needed workout at the Y. I will tell you all about my Seattle adventure soon, but for now I want to let all you local readers know about a class I’m teaching next week. This is the same technique I’m using to create my ArtPrize entry. Read on for the class details and I’ll be back soon! 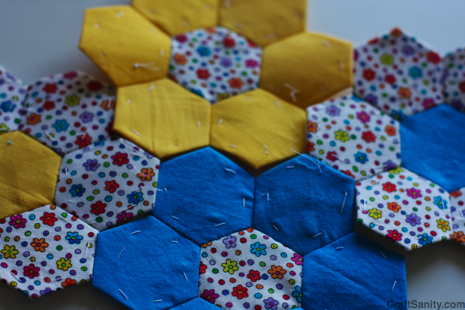 Learn to make hexagon flowers with this very addictive hand-piecing technique popular in 1930s quilts. 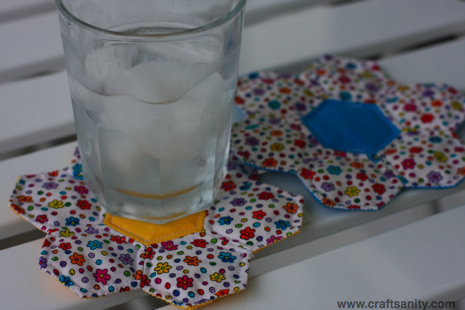 For a very modern twist, machine sewing techniques can be used to turn hand-sewn hexagon flowers into attractive drink coasters. Please stop in or call 616-531-5561 to register. Hello! I simply would like to give a huge thumbs up for the nice information you’ve got here on this post. I can be coming back to your weblog for more soon. Hi there would you mind stating which blog platform you’re using? I’m looking to start my own blog soon but I’m having a hard time selecting to go with Drupal.